(يالطيفا لم يزل الطف بنا فيما نزل إنك لطيفٌ لم تزل ألطف بنا والمسلمين (100 مرة. (لااله الاانت سبحانك اني كنت من الظالمين (100 مرة. (حسبنا الله ونعم الوكيل (100 مرة. (بسم الله الذي لا يضر مع اسمه شيء في الارض ولا في السماء وهو السميع العليم (100 مرة. (ليس لها من دون الله كاشفه (100 مرة. 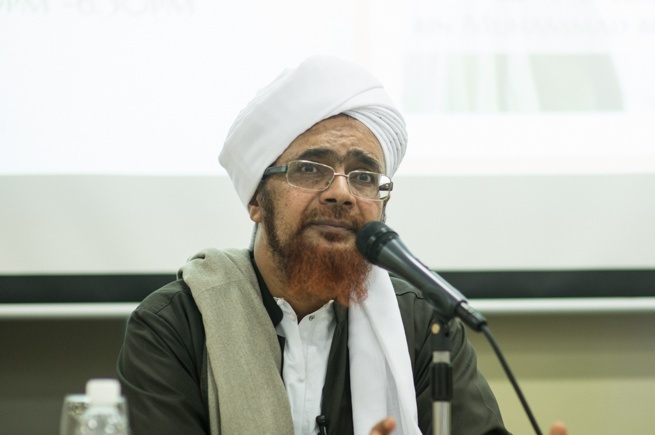 A summary of a lecture delivered by Habib Umar bin Hafiz (may Allah preserve him and benefit us by him) in Sultan Mosque, Singapore, 17th November 2015 / 6th Safar 1437. The Messenger of Allah ﷺ informed us that Allah has opened the door of repentance, a door so wide that it would take seventy years to cross from one side to the other and that it will remain open until the sun rises from the west. Out of His immense generosity, Allah has opened to us this door and invited us to enter. The disbelievers of Quraysh requested that the Prophet ﷺ ask Allah to turn Mount Safa into gold. Allah gave the Prophet a choice: He would either turn Safa into gold but if the Quraysh did not then believe, He would punish them in the most severe way, or He would open to the Ummah the door of mercy and repentance. The Prophet chose the latter, because he knew what would be most beneficial for the Ummah. As a result, the Quraysh eventually entered Islam in droves. Allah has no need of His creation but rather His creation is in desperate need of Him. It is only out of His kindness and compassion that He has given us the opportunity to repent and He promised that if someone sincerely repents He will replace their bad deeds with good deeds. Allah says: You must all repent to Allah, O believers, perhaps that you may succeed. He thus made it obligatory for every person to repent. Even the Prophets and the Siddiqun are in need of repenting to Allah, let alone those who are lower in rank. People’s repentance is of different degrees: there are those who repent from disbelief and accept Islam; there are those who repent from major sins; there are those who repent from minor sins; there are those who repent from things which are disliked or dubious and there are those who repent from being heedless of Allah even for a moment. It is said that the deeds that the pious consider to be good are considered by those who have been drawn near to be bad deeds. Imam al-Junayd said that he had been seeking forgiveness for thirty years for one word which he said. He sought forgiveness for saying ‘alhamdulillah’ (all praise be to Allah) which is in itself a good deed. However, he felt that he had said it at the wrong time. He was told that a fire had burned down all the shops in the area but when the fire reached his shop it went out and did not burn it. He said ‘alhamdulillah,’ but then realised that he was showing gratitude for other people’s misfortune. For that reason he sought Allah’s forgiveness. On another occasion he saw a young man begging in the street. A thought crossed his mind that this young man could use his strength to earn a living and thus not need to beg. When he went to sleep that night he saw in a dream that the young man was dead and had been placed in front of him. The scholars are in agreement that if someone sincerely repents from any sin it will be accepted although there is a difference of opinion over the sin of deliberately killing a Muslim. This is due to the fact that a Muslim’s blood is sacrosanct. The Prophet ﷺ said: “If all the inhabitants of the heavens and earth conspired to wrongly kill a Muslim, Allah would cast them all into the Fire.” The correct opinion, however, is that someone may repent from deliberately killing a Muslim. Once when Sayyiduna `Abdullah Ibn `Abbas was sitting in a gathering a man came and asked him if someone who has committed murder may repent. Ibn `Abbas said yes. Then another man came and asked the same question. Ibn `Abbas said no. The people present were surprised. Ibn `Abbas explained by saying: “I could tell that the first man had already committed murder and wished to repent so I opened the door of repentance to him and thus prevented him from causing more corruption on the earth. I could tell that the second man had been a dispute with someone and was contemplating killing him. I told him that he could not repent so that he would not end up in the Fire.” The found it to be exactly as Ibn `Abbas had said. From this we learn that giving a religious verdict (fatwa) is a huge responsibility. Today we have people with very little knowledge giving fatwa. They give one opinion in the morning and in the evening they give a contradictory opinion. They give an opinion based on a political or social situation and then the situation changes and they give a different opinion. This is because they follow their caprice and their desires and do not seek Allah’s pleasure. Ibn `Abbas took into account the state of the person asking. Scholars should have compassion for people, want good for them and fear exposing them to the wrath of Allah. Habib Umar then mentioned the story of the three men who stayed in Madinah and did not go out with the Prophet on the expedition to Tabuk. When Allah eventually accepted their repentance, the Prophet smiled at one of them, Ka`b bin Malik, and said to him: “This is your best day since the day your mother gave birth to you.” This shows the greatness of repentance – it was the best day of his life because it was the day on which Allah accepted his repentance. Allah made it the best day for Ka`b, so make it the best night for us. May Allah allow us to repent to Him sincerely. The scholars say that sincere repentance is guaranteed to be accepted if it fulfils the conditions, because Allah says: He is the One who accepts the repentance of His slaves. The most important element of repentance is having remorse for one’s sins. The secret to this remorse is knowing the greatness of the One you have disobeyed. According to your knowledge of His greatness you fear your sins and return to Him. This is one of the differences between the believer and the hypocrite. Whenever the believer remembers his sins he increases in fear, remorse and pain, whereas the hypocrite may even be proud of his sins. The scholars say that being happy for committing a sin is worse than the sin itself, because such a person has no regard for Allah. There are things which assist in your repentance being accepted such as making wudu and performing two units of prayer and giving charity. One of the greatest of these things is coming to the Prophet ﷺ , which Allah mentions in His Book. Al-`Utbi was at the grave of the Prophet when a Bedouin approached and said: “O Allah, You said: If only when they wronged themselves, they came to you and sought Allah’s forgiveness and the Messenger sought forgiveness for them, they would have found Allah Oft-Returning, Most Merciful. I have come to Your Prophet seeking forgiveness, so forgive me.” Al-`Utbi feel asleep and saw the Prophet in a dream. The Prophet told him to tell the Bedouin that Allah had forgiven him. On another occasion a Bedouin approached the grave of the Prophet ﷺ and said: “O Allah, this is Your Beloved, the devil is Your enemy and I am Your slave. If You forgive me, Your Beloved will rejoice, Your enemy will grieve and Your slave will be saved. But if You do not forgive me, Your Beloved will grieve, Your enemy will rejoice and Your slave will be destroyed. You are too generous to cause Your enemy to rejoice, Your Beloved to grieve and Your slave to be destroyed.” We ask Allah that He causes His Beloved to rejoice and causes His enemy to grieve by allowing us to repent. Allah has invited us to repent to Him so no one has any excuse not to enter after the door has been opened. We all have wrong deeds and if You forgive them we will be saved. But how can we meet You if we have even one sin that You have not forgiven? How will you respond if He asks you about that sin? Allah rejoices over the repentance of His slave more than a woman who, having despaired of conceiving, is then blessed with a child; He rejoices more than someone who, having lost the most precious thing he possesses, then finds it and He rejoices more than someone who, having been extremely thirsty, then finds water. How do you see Your Lord? How can you not return to Him? You will stand in front of Him. So prepare now for that time. Repent sincerely by having true remorse and a firm resolve never to return to disobedience. O Allah, enable our ears to repent so that we do not listen to anything which is forbidden. Allow us then to hear the good tidings of the angels at the point of death, to hear the speech of Your Prophets on the Day of Judgement, and to hear Your words of pardon. When Muslims repent they show the world the beauty of Islam and they make it a safer place, because they take themselves to account out of fear of their Lord. O Allah, fill our hearts with veneration for You. The first is when our souls leave our bodies. Give us the best of endings. May our faith not be removed at this point. The second is when we are placed in our graves. Give us comfort in our graves and make them gardens of Paradise. The fourth is when our actions are weighed upon the Scales. May Allah make our good deeds weighty on that day. The fifth is when we receive the books in which our deeds are recorded. May we receive our books in our right hands. The sixth is when we are commanded to cross the bridge (Sirat) which passes over the Fire. Allow us to cross the Bridge with the Prophet ﷺ and enter Paradise with him, for he will be the first to enter. 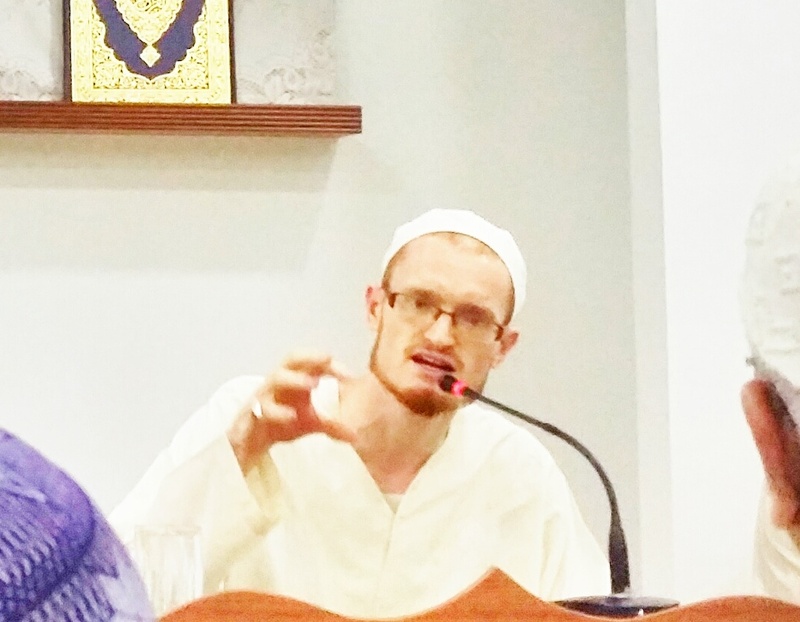 Ustaz Amin Buxton hails from the United Kingdom. He converted to Islam in 1999 and graduated with a bachelor’s degree in Arabic and Islamic Studies from the famed School of African and Oriental Studies (SOAS), London, in 2003. Thereafter, Ustaz Amin enrolled at the prestigious Darul Mustafa Institute of Islamic Sciences, Tarim, Hadramawt, studying the sacred sciences at the feet of the scholars of Tarim. Today, Ustaz Amin continues to study at Darul Mustafa whilst carrying out teaching and translation duties at the same institution. Ustaz Amin also performs live Arabic-English translations of Sayyidil Habib Umar bin Hafiz’s speeches at various events, and has travelled to across Europe to teach Islam, both as a daiy (caller) in his own right, and as a translator for the likes of Habib Umar bin Hafiz, Habib Kazim As-Seggaf, and others. Ustaz Amin is the main administrator and writer at Muwasala.org which functions as, amongst other things, an English-language da’wah (missionary) platform in the manhaj (methodology) of the School of Hadramawt. He has translated several classical and contemporary Islamic literature into English including Qutbul-Irshad Imam Al-Haddad’s poem “If You Wish For Felicity”, and Shaykh Umar bin Hussein al-Khatib’s “Prophetic Guidance”. He is also author of “Imams of the Valley”. Majlis Al-Muwasolah Singapura wishes Ustaz Amin Buxton every success in his da’wah efforts. Tidak dapat dinafikan, adalah menjadi suatu kepayahan untuk mendapatkan hakikat kebenaran dan dapat melihat sesuatu dengan ilmu pengetahuan berdasarkan sumber-sumber informasi dari media yang wujud zaman sekarang. Dan perumpamaaan orang yang mendalaminya seperti orang yang menyelami di pangkal lautan. Manusia berbicara tentang laut. Semua manusia memang tahu tentang sebahagian dari ciri-ciri yang ada pada laut, tetapi yang masuk menyelam ke dalam laut hal mereka berbeza ketika mereka berbicara tentangnya, dan tentu sekali hasil yang mereka bawa bersama mereka berbeza sama sekali. Dan ke atas mereka yang takut untuk menyelami ke pangkal lautan, sekurang-kurangnya jangan pula mendakwa dirinya telah melihat dan memahami setiap inci batu-batu mutiara dan permata, memilikinya dan telah mengambilnya sendiri dengan tangan mereka. Jika terdapat padanya mutiara, maka hendaklah sekurang-kurangnya mengaku yang mutiara tersebut dierima dari tangan si penyelam, dan bukanlah langusung dari usaha tangannya sendiri. Sesungguhnya mutiara tersebut sampai kepada dirinya mungkin menerusi hartanya (membeli), atau pemberian orang kepadanya atau dengan cara-cara lain. Begitulah juga halnya dengan lautan ilmu, pendapat-pendapat dan cara-cara untuk memahami dalil-dalil di dalam Al-Quran dan Hadis. Sesungguhnya Allah telah mempersiapkan para penyelam untuk tujuan itu. Sekiranya kalian hendak mengeluarkan batu-batu mutiara maka ambillah, kerana ianya tidaklah diharamkan ke atas kalian. Tetapi sekiranya kalian takut, atau tidak mampu, atau tidak mempunyai keupayaan dan kebolehan untuk menyelam di pangkal lautan, maka serahkanlah urusan ini kepada ahlinya, kemudian dapatkanlah mutiara-mutiara tersebut darinya sekembalinya dia dari penyelamannya.